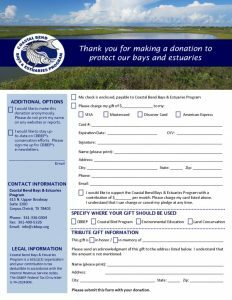 The Coastal Bend Bays & Estuaries Program is a non-profit, 501(c)3 organization. We are grateful for the generous support we receive from individuals, businesses, and foundations throughout the region. It is because of your support that we can carry out our mission. This organization does not share your personal information without your expressed permission. Your tax-deductible gift provides essential funding for our education, research, and conservation initiatives. Your gift can provide scholarships for classroom visits to the Nueces Delta Preserve or summer teacher workshops. Any size gift will help provide necessary funding for free programs for students and teachers to spend time together discovering and learning about nature. Your generosity can help support the important research conducted throughout the Coastal Bend leading to a better understanding of the area in which we live. We thank you for your gift. Together, we will protect and maintain the Coastal Bend and the Nueces Delta Preserve so that these wilderness areas remain for future generations to visit and enjoy. In Honor Of…..Show someone how special they are by giving a gift in their honor. Celebrate life and its most important moments such as birthdays, anniversaries and weddings. Your tax-deductible gift is an excellent way to recognize those important to you by contributing to the protection of our vanishing wilderness areas and our natural resources. In Memory Of…..Provide a lasting tribute on behalf of a loved one in your life. Give a gift of remembrance that will make a difference. Your tax-deductible donation will help the CBBEP continue educating others on conservation and land stewardship. General Endowment: Your donation will be applied to a fund that will allow the CBBEP to operate and thrive for many years to come. Research Endowment: Your donation will support a fund that is used for the vital research of land management practices that are in use in the Coastal Bend.